The newest generation of Radions radically re-define the simplicity, beauty and power of the LED light. The best aquarium LED light in the world just got better. Simply put, the G4 Radion the best thing since the G3 Radion. More Color The Radion G4 features a whole new cluster. The re-balancing of proven colors combined with the addition of warm white and violet takes color rendition for your corals to the next level. Reconfiguration of the clusters compliments the all-new HEI lenses to deliver balanced color mixing better than ever before. More Coverage The HEI lenses on the G4 deliver more usable light area. This is accomplished by spreading light that would normally create an area of high PAR directly under the LED fixture and redirecting it to a significantly wider optimal area of intensity for coral health and growth. This will reduce shadowing in the aquarium as well as increase usable space for coral at all depths. More Civilized EcoTech aims to produce the most minimally intrusive equipment available. The G4 continues to boast Radion’s sleek styling and small footprint but now also features greatly reduced operational noise. To achieve this the G4 incorporates a completely redesigned heatsink with new geometry and micro-fins. The G4 features water resistant tactile buttons and full integration with EcoSmart Live. Generation 4 includes up to *7 discreet color channels. *G4 Pro Models Only. HEI Optics Hemispherical Edge Illumination Generation 4 includes the most sophisticated lens design available. HEI lenses deliver the light uniformity and color mixing of a halide T5 combo without sacrificing the power and efficiency of the LEDs. 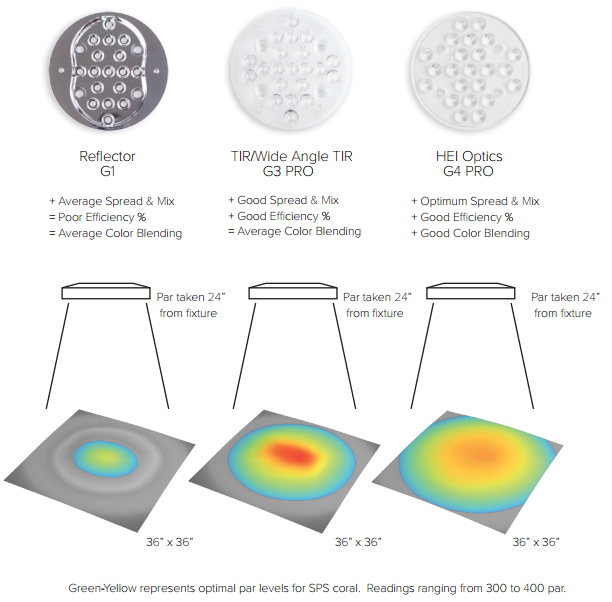 Color The G4 utilizes the most advanced top-bin diodes offered by CREE, OSRAM and Semiled to produce mind-blowing color rendition. The evolution of color in LED fixtures started with the original full-spectrum Radion. The G4 builds on this impressive legacy by further advancing both the available spectrum and channel control. See color in a whole new light. The G4 heatsink has been designed from the ground up to maximize surface area and allow for superior heat dispersion. Multiple channels provide unrestricted airflow. With such effective heat management, the need to actively cool the LED is greatly reduced and with it airflow and fan noise. Optimum LED performance requires active cooling; the Radion G4 uses a proven computer controlled IP55 rated fan. Radions have successfully been growing coral since the original Radion. Over time the Radion product has evolved, increasing in range of spectrum, output and coverage along with aesthetic, control and operational improvements. 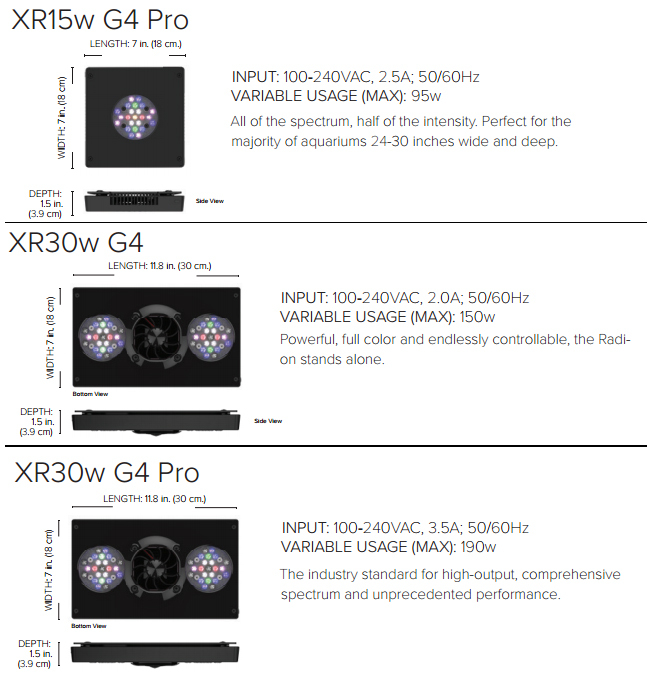 The Generation 4 offers a further-tuned spectrum, more even color mixing and superior coverage. Yes. 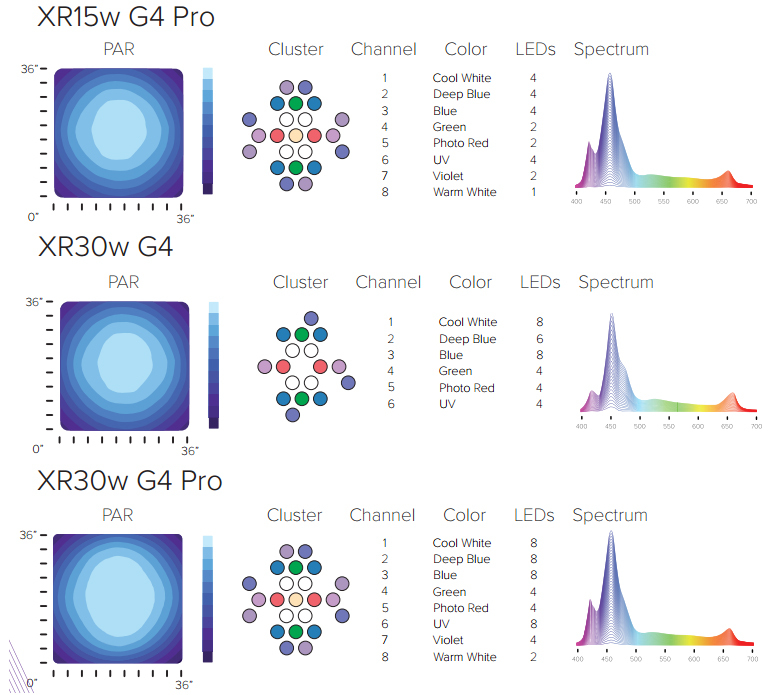 Thanks to the new HEI Optics and LED placement the G4 provides more than twice the optimal PAR zone as compared to previous Radion generations. The geometry of the HEI Optics accomplishes two things. Light that would normally be lost tangentially to the fixture is redirected downwards while high intensity output is distributed outwards. The net result is much larger and more even PAR distribution for significantly more usable lighting area. PAR testing shows the increase in this area to be substantial. Yes. All RMS and classic mounting solutions such as the hanging kit and classic rails will work with G4 Radions. All EcoTech products carry a 1-year parts and labor warranty in the US and the appropriate variation of that in international markets. Yes. The setup and programming of Generation 4 Radions are exactly the same as previous model Radions. Additional control functionality will be available as appropriate for Gen 4 lights. No. Unfortunately, the technical improvements in the G4 required the use of a new heatsink, clusters, lenses and driver board. Because of these changes the shared parts between the G4 and previous-model Radions are minimal. EcoTech will continue to support G3-version Radions for a minimum of 24 months after the production change to G4. Will the G3 and G3 Pro upgrade kits still be available for Radion generation 1 and 2 owners?